Attending the annual Berlin Christopher Street Day Parade this past weekend marked my second experience with the increasingly global phenomenon of LGBT Pride. My first experience took place in my home city, Boston, USA, in the summer after I graduated high school. I remember the anticipation leading up to this first exposure to LGBT cultural events. Indeed, I had imagined it would be a breath of fresh air after the stale, heteronormative ambience of my US suburban high school life. Donning purple lipstick, a flowery wreath on my head, and dark blue eyeshadow, I prepared for what I hoped to be a liberating political experience. Instead, I found the parade sterile, depoliticized, and exploited by commercially interested parties. As fellow BCB student Elena Gagovska writes in her article on Skopje Pride in 2017, contemporary LGBT Pride parades, especially in the West, often fall victim to “Rainbow Capitalism” — a phenomenon whereby corporations exploit the rising acceptance of LGBT people to further their business agendas. Boston Pride was no different: the parade was saturated with floats from the likes of Bank of America, TD Bank, and Adidas, while actual political rhetoric was scarce. Given my past experience with Pride, I went into Christopher Street Day with a certain weariness. It is always disheartening to see what was once a radical act of political resistance co-opted by detached corporate entities to promote their wares and services. As Elena explains in her article, Prides across the world stem from the Stonewall Riots of 1969 in which incensed gay and trans patrons at the Stonewall Inn in Greenwich Village, New York, violently counterattacked police officers who would arbitrarily raid one of the only places where LGBT people could congregate with relatively little fear of violence. Bricks were thrown until it was the oppressors who felt fear from the oppressed. This momentous action has been memorialized by the annual Pride parades in the years and decades since, starting in New York and L.A., reaching Berlin in 1979. [*1] Indeed, the term “Christopher Street Day” refers to the street where the Stonewall Inn is located in Greenwich Village. Thus Pride celebrations are inherently historical events that memorialize the early struggles of the LGBT community. Accordingly, they should strive to preserve the solidarity that these struggles have engendered. The commercialization and shameless promotion of political parties at Pride parades is justly criticized as this obscures the historical reality of the LGBT rights movement, which was not, until recently, even rhetorically (let alone materially) supported by corporations. 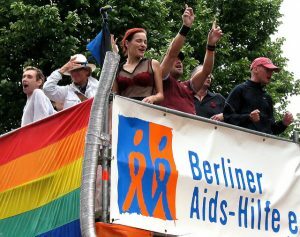 Berlin CSD has come under fire for its inclusion of corporate floats and political parties for these precise reasons. For instance, famous philosopher of gender and sexuality Judith Butler refused to accept the Civil Courage Award granted to her at Berlin’s 2010 CSD, citing the parade’s over-commercialization and lack of anti-racist action as her reasons. [*2] My own experience at the Parade mirrors her grievances. There was an abundance of corporate presence, notably from BMW, Booking.com, and Airbnb. Moreover, rainbow-colored Israeli flags were sported by dozens — a perfect example of pinkwashing: the self-presentation of a company or state as LGBT-friendly in order to obscure their unethical practices. With the distribution of rainbow Israeli flags, the human rights violations carried out by the Israeli state against Palestinians are obscured by the state’s alleged acceptance of LGBT people. Similarly to CSD, Boston Pride has been corrupted by the process of depoliticization and corporatization of LGBT struggles. It is almost devoid of political significance and is instead a highly regulated street party that lacks any sense of celebration. The Parade was strictly regulated, ending, with no after party, at its scheduled time. And, as per state law, people were not allowed to have alcohol in the streets. But these somewhat irritating details of the Parade are frivolous when compared to the pro-cop sentiment that permeated the parade. This sentiment was expressed by both an individual float run by the Boston Police alongside a separate LGBT police pride float unaffiliated with the Boston Police force itself. This is a rather ahistorical stance, given the institutional violence that cops have inflicted upon LGBT people all over the world. In this regard, Boston pride lost the sense of political radicality that marked the first Pride Parades — events that were radical insofar as they unabashedly made demands of those in power that had previously been unthinkable. I would argue that this is a symptom of the very real ‘deradicalization’ of LGBT politics in the West, a natural result of the liberalization of attitudes towards LGBT people in Western society. While this reaction is indeed lamentable, one has to acknowledge that it is not completely the result of a diminished relevance of LGBT issues, but of the improvement of the political and material reality of many LGBT people’s lives in past decades. It must be noted that this is of course a generalization: there are countless areas in the West rife with violent homophobia and transphobia, just as the political and material reality of LGBT people has, by and large, not improved in other parts of the world. Most LGBT people from the Bible Belt of the United States would agree that homophobia and transphobia are still alive and well. One survey of rural LGBT people in the UK found that 8 out of 10 respondents had experienced verbal or physical harassment, with 1 out of 10 having experienced assault. [*8] These persistent and insidious social realities must be countered through a radical LGBT politics — radical in that it overturns the ideological frameworks that allow these statistics to be reality. My issue with the notion of ‘re-radicalizing’ Pride in the West is that, given the changed political conditions of LGBT people now in comparison with the 60s, 70s, or 80s, focusing on Pride as the site of radical LGBT resistance seems misguided. The radical approach needed today will not, or cannot, look like it once did. Moreover, the nostalgia for a past radical politics obscures the reality of the current day, obstructing the path for a radical politics of the present. Attempting to re-radicalize Pride Parades and LGBT terminology is a symptom of this nostalgia. The call for re-radicalization of Pride seems to me like a sort of aestheticization of the past LGBT struggle and of past political tactics. Overuse of the term “queer” and complaints about too much “partying” in Pride parades seem lacking in actually radical political content. This merely ascribes a radical, “queer” aesthetic to the LGBT politics of today. Radical politics are crucial and historically have been crucial to LGBT liberation, but they are not only enactable on one day of the year or through nebulous, “queer” language. The most radical LGBT politics are those that call attention to the contemporary material conditions of LGBT people, namely the increased risk of physical and verbal abuse, illnesses both mental and physical, poverty, and even legislative oppression. In my home country, for example, there is currently no nationwide anti-discrimination law for LGBT people, meaning in some states (27 of them), it is legal to deny housing to people based on their perceived gender identity or sexual orientation. [*9] More recently, the US Supreme Court ruled that businesses can deny service to gay and trans people if they have strong religious convictions that supposedly prevent them from doing so. [*10] Even in the supposedly “progressive” West, conservatism is still a terrifying and mighty force to be reckoned with. This force must be addressed by a radical LGBT politics. CSD and other celebratory Pride parades are neither the beginning nor end of LGBT activism, nor the only site of its manifestation. Pride events such as the CSD are symbolic sites of celebration and historical continuity of an ongoing, global struggle. Recognizing the insidious effect of commercialization and depoliticization of these events is essential; my and many others’ experience of Boston pride serves to corroborate this. But the fundamental historical and political importance of Pride events should not be disavowed in the name of vague radicality. Indeed, Pride is the spatialized demonstration of the improved material conditions for LGBT people in many parts of the world. Nonetheless, it must always remain a stage to express solidarity with other LGBT people who have not benefited from these improved conditions, and remain conscientious of them. [*1] “From Demo to Party.” Goethe Institute, www.goethe.de/en/kul/mol/20789860.html. [*2] “Judith Butler Refused the Courage Award from the Berlin Pride.” Sexuality Policy Watch, 6 July 2010, sxpolitics.org/around-the-world-115/4711. [*3] “Gesetz Über Die Änderung Der Vornamen Und Die Feststellung Der Geschlechtszugehörigkeit in Besonderen Fällen (Transsexuellengesetz – TSG).” Bundesministerium Der Justiz Und Für Verbraucherschutz, www.gesetze-im-internet.de/tsg/BJNR016540980.html. [*4] Schliess, Gero. 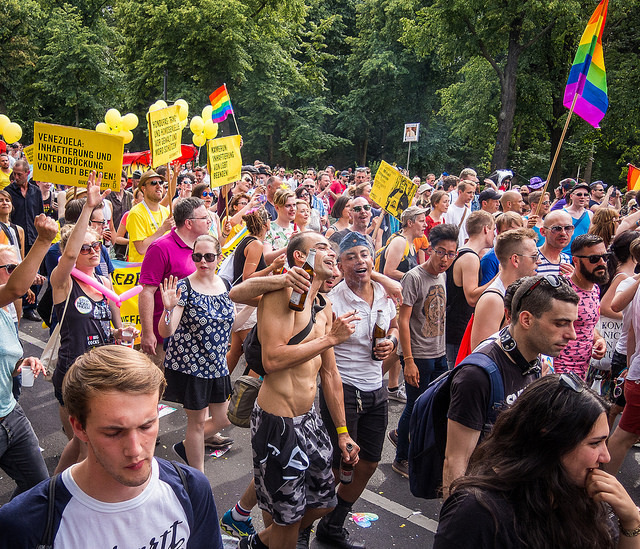 “Berlin Pride: More Politics than Partying.” Deutsche Welle, 28 July 2018. [*6] See fellow BCB student Elena Gagovska’s article on identity politics and the military. [*7] Knight, Ben. “Germany to Expand Global Military Missions.” Deutsche Welle, 7 Mar. 2018. [*8] Cusick, James. “LGBT People Are Subjected to Hate Crimes ‘on Daily Basis’ in UK Rural Communities.” The Independent, 23 June 2015. [*9] Wikipedia contributors. “LGBT rights in the United States.” Wikipedia, The Free Encyclopedia. Wikipedia, The Free Encyclopedia, 6 Aug. 2018. Web. 6 Aug. 2018. [*10] Smith, David, and Lucia Graves. “Court Rules in Favor of Masterpiece Cakeshop, but Doesn’t Address Principle of Whether a Business Can Refuse to Serve Gay People.” The Guardian , 4 June 2018.